There were no other cars around, so our guide let me bend the rules this one time. He opened up the sunroof and I stood up on the center console before carefully levering my shoulders through the small opening. 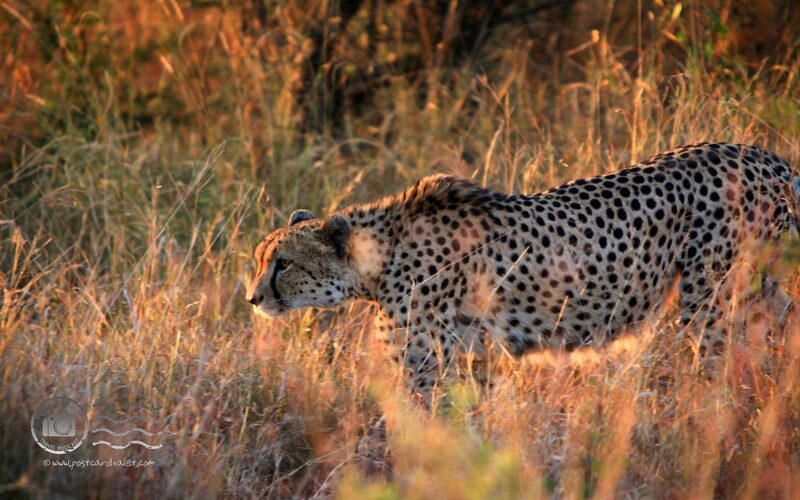 As I got my camera up, the cheetah was alongside our vehicle, heading behind us, but paralleling the road. Our driver put the car in neutral and we coasted along beside him. I got some great video footage of him walking through the brush like that. Eventually we stopped and he went about marking a thick tree on the opposite side of the road. If I’d been shooting out the passenger window, I would have lost him, but because I was standing up through the sunroof, I was able to pivot and continue shooting. The sun was now at my back, so I switched the 5D off Live View (video) mode and started taking pictures. I got this photo when he turned to walk away. We took literally thousands of photos while on safari in Kruger and a handful of them turned out quite well. This one, however, may be my favorite. Photoshop: Auto contrast, slight saturation boost, slight dodging around the eye. The story of spotting this particular cheetah is told in our African Big 5 Safari video, starting at the 19 min, 48 sec mark. great picture! such an amazing animal! golden hour didn’t hurt either!